Had too many Easter eggs? Still feeling the after-Easter guilt? You’re in good company. Almost two-thirds of Australians reach for chocolate in any given four weeks and those of us who make a conscious effort to look after our health are just as likely to snack on it as anyone else. RELATED: Dark Chocolate: Bad Or Benefitial? Recent data from Ray Morgan Research reveals that there’s no clear relationship between body weight, health habits and love of chocolate. Whether you’re underweight, overweight or within the healthy weight range, you’re equally likely to include it in your diet. Even people who restrict how much fattening food they eat and those who prefer healthy snacks will have chocolate at least once in an average four-week period. So why do we love it so much? Dark chocolate helps your body produce serotonin, one of the happy hormones. Add to that the effect of sugar and caffeine, and it’s no wonder you feel on a high after your favourite treat. There’s a strong association between chocolate and love in our society. It is the traditional gift to express romantic feelings and celebrate special occasions. 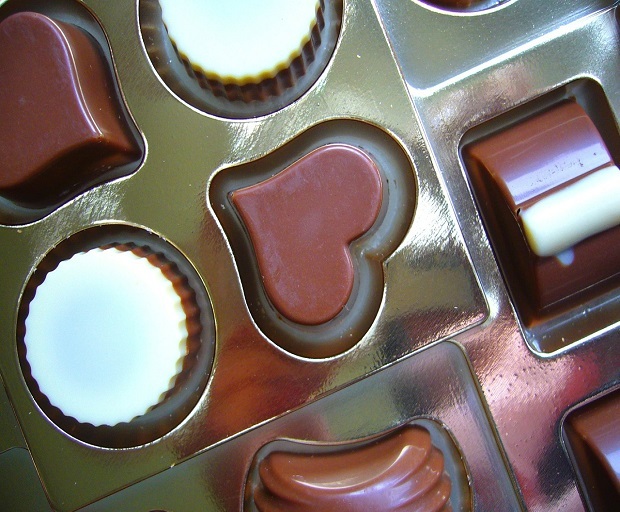 Just imagine Valentine’s Day without chocolate… Impossible! We all get tired of working hard, trying to be healthy and follow all kind of rules, and we need a break. Chocolate represents the perfect reward. It’s easy to reach for, it makes us feel good and it can quickly turn into a vice if we over-indulge (nothing like the allure of the forbidden fruit to make us crave more). Of course, not all chocolate is created equal and if we can’t resist it, we can at least make the most of it. Have you tried making your own chocolate rum balls or dark chocolate bark? Pure bliss!